Huge Savings Item! 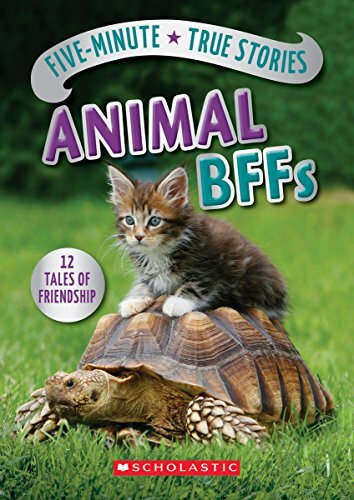 Save 20% on the Five-Minute True Stories: Animal BFFs by SCHOLASTIC at Cmc Schools. Hurry! Limited time offer. Offer valid only while supplies last. Joker the dog loves to dive in and swim with his dolphin buddies. Gerald, a shy giraffe, learned to make friends with help from his goat pal, Eddie. Joker the dog loves to dive in and swim with his dolphin buddies. Gerald, a shy giraffe, learned to make friends with help from his goat pal, Eddie. And Miwa-chan the monkey always gets piggyback rides from his friend Uribo-a wild pig! These are 12 incredible tales of unlikely animal friendships. Perfect as an introduction to nonfiction, young readers will learn simple facts about animals and their behaviors.